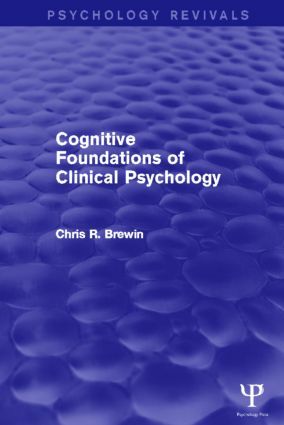 Originally published in 1988,this was the first textbook to review and integrate the cognitive theories underlying the practice of modern clinical psychology. Written in a clear and readable way, it uses many clinical examples to relate the theories to what therapists actually do. It describes the strengths and weaknesses of the theories and develops a common framework drawn from research in social and cognitive psychology to explain the mechanisms of behavioural and cognitive therapy. Among the topics covered are the validity of self-reports; experimental investigations of nonconscious processes; cognitive theories of conditioning; the relation between cognition and emotional disorders such as anxiety and depression; self-esteem and the development of self-schema; self-efficacy; explanation and causal attribution; personal values and goals; self-regulation and the techniques of cognitive therapy. This textbook is designed for advanced undergraduate and postgraduate courses in clinical and abnormal psychology. Its practical focus will also make it of particular interest to practising clinical psychologists, psychiatrists and other mental health professionals. Preface. 1 Introduction: Cognition and Clinical Psychology 2 Conscious and Unconscious 3 Cognition and Conditioning 4 Cognition and Affect 5 Information-processing, Anxiety, and Depression 6 Explanation and Attribution 7 Expectancy and Perceived Control 8 Values and Goals 9 Cognition and Interpersonal Relationships 10 Therapy. References. Author Index. Subject Index.